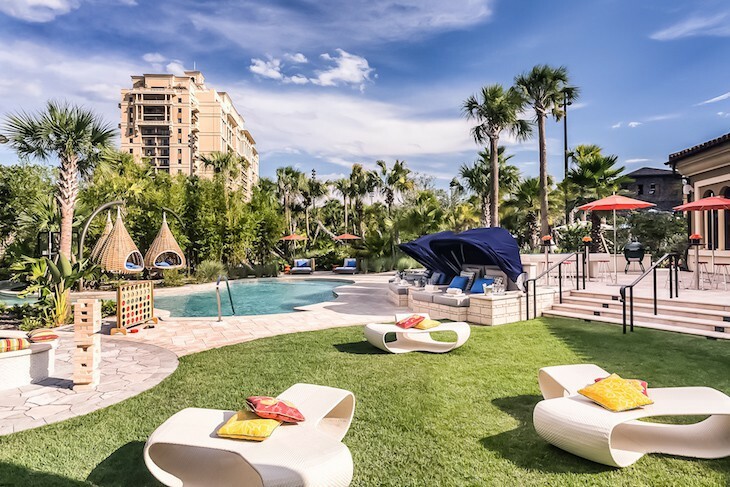 Bringing a fresh sense of style to the Orlando area and designed to reflect the Spanish Revival architecture of Florida’s golden age, this captivating, 17-story resort soars above a tranquil landscape complete with a fantasy pool complex, lavish guest rooms and suites, indulgent spa, secluded golf course . . . pure 5-star luxury. 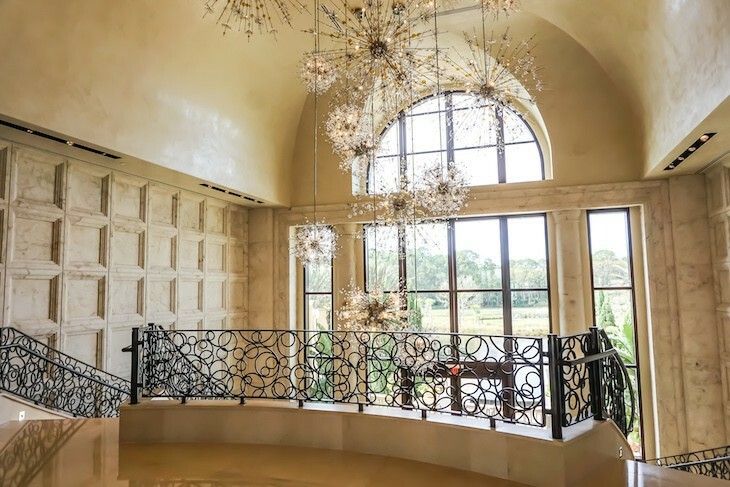 Your first glimpse of the lobby is of a multi-story staircase lit with a dramatic “fireworks” chandelier composed of more than 30,000 crystal pieces illuminated by 250 sleeves of LED lights overlooking the resort’s dreamy landscape through massive windows. 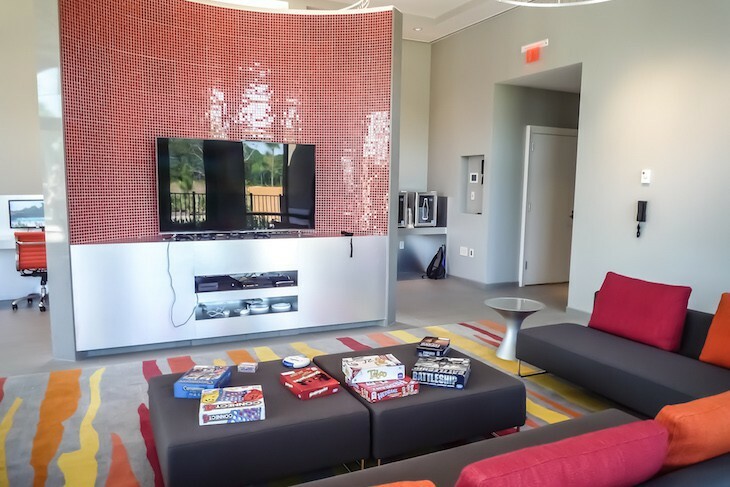 The low-keyed reception area features tangerine and terra cotta-colored mosaic tile flooring, a Disney planning desk, and a children’s area with a touchscreen map of the resort. No nickel and diming at this resort where there is no resort fee charged. Included are tons of amenities: a complimentary kids camp open 8 hours daily; kids 5 and under eat free; 24-hour fitness center with select fitness classes; transportation to the four Disney theme parks; spa relaxation areas including a steam room, Jacuzzi, experience shower, and tranquility lounge; Wi-Fi; video game room; and select tennis and golf lessons weekly. Although this is not a Disney-owned resort there is a Disney Planning Center in the lobby and guests receive package delivery from the parks. 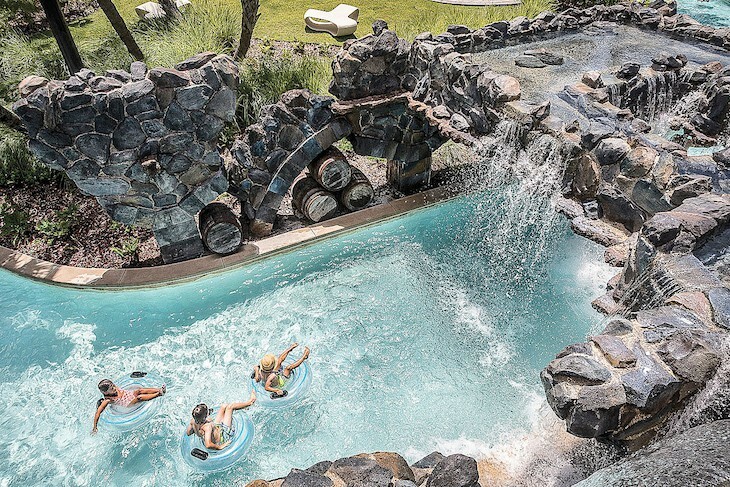 However, charging privileges to your resort account do not extend outside of the Four Seasons, and Disney’s Magical Express is not offered when staying here. 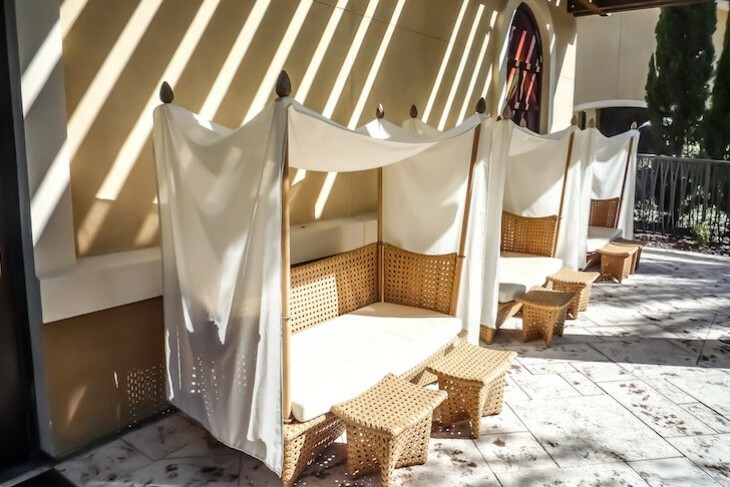 A huge variety of exotic outdoor relaxation and seating areas are to be found on the verandahs, around the pool areas, or inside and out at each restaurant. In every shape, size, and color you'll find contemporary booths, pods, exotic tables, canopied lounges for two, daybeds, kid’s teepees . . . the list goes on. It’s almost a bit silly to rent a private pool cabana given the variety of options, although they are hard to resist. 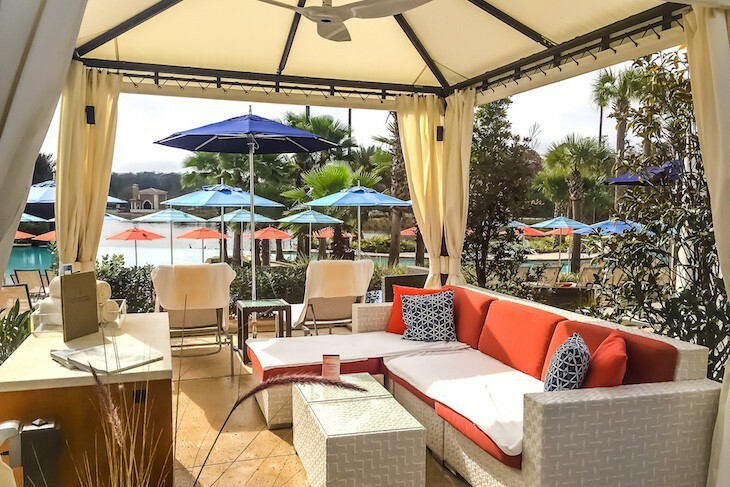 The Four Seasons is all about keeping the perfect balance while at Disney World. 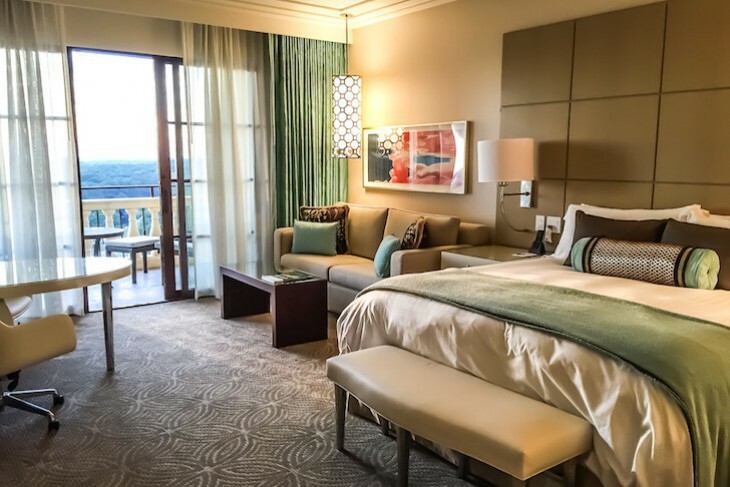 Spend the time you like at the theme parks and then come back to decompress in luxury. Also a perfect balance while at the resort; plenty of options for all ages, both as a family and individually. 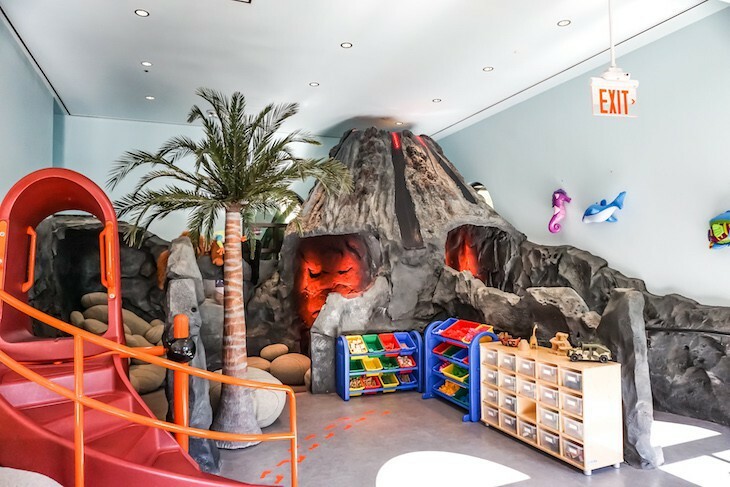 How darling are these cabanas at Four Seasons Kids For All Seasons club? 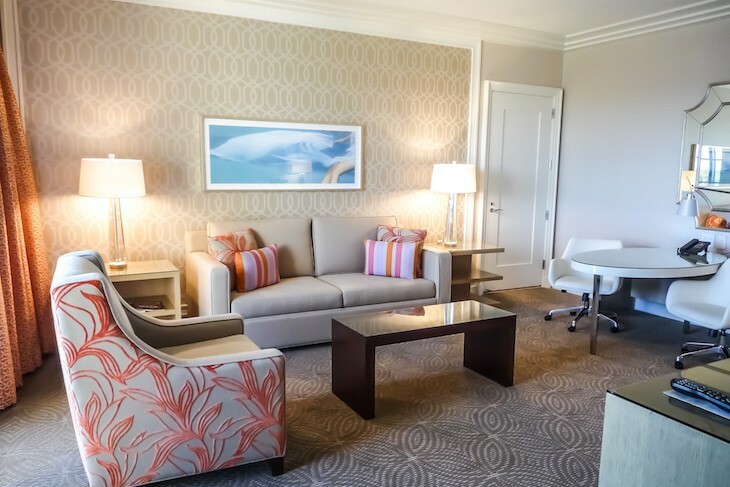 Offering the most stunning décor in all of Orlando, a soothing palette of dove gray, canary yellow, and loads of soft white are in the guest room hallways while inside are one of two color schemes: aquamarine/chocolate or tangerine/taupe. 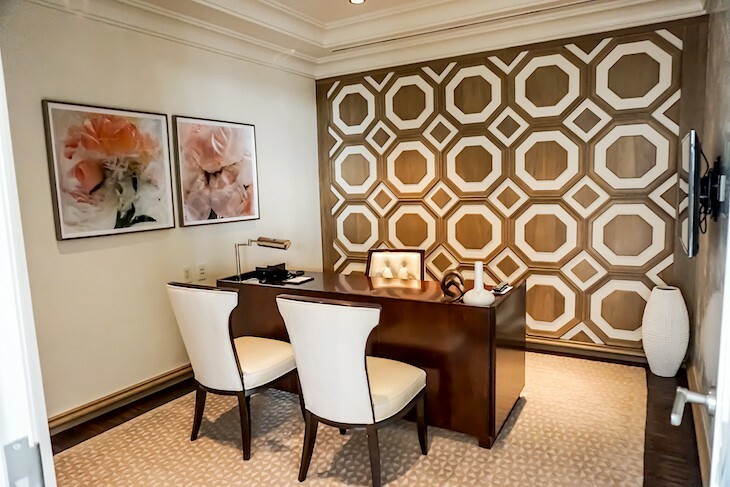 Walls are done in a creamy textured paper, while carpeting is taupe and cream patterned. 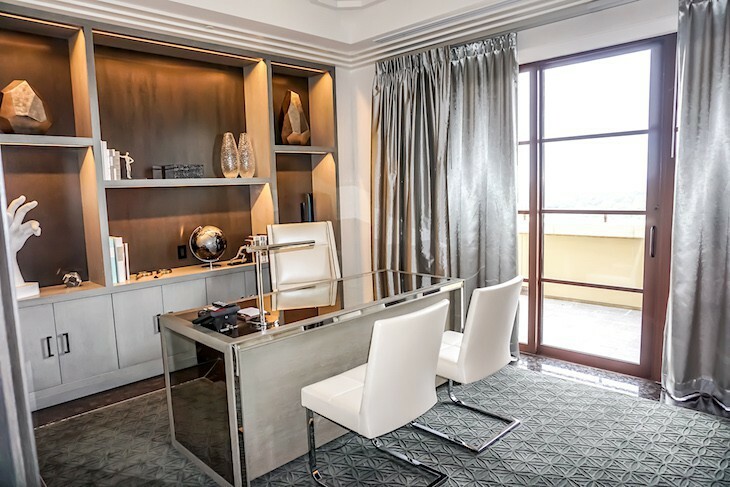 Enjoy the workspace of a large glass-top oval desk/dining table and two white leather chairs, while atop the white multi-drawer bureau is a large LED-screen television. Rooms with a king bed come with a queen sleeper sofa and coffee table; those with two double beds do not. Beds, encircled by an accent wall composed of contemporary wood blocks, are absolutely the most comfortable in Orlando. Eeach offer gorgeous white bedside tables inlaid with silver. An alcove holds your laptop-size electronic safe and a Nespresso espresso machine. Super room amenities include a Bose Soundlink Bluetooth Speaker, full coffee and tea setup, complimentary standard Internet, two-line telephone, CD clock radio, and IPod docking station. 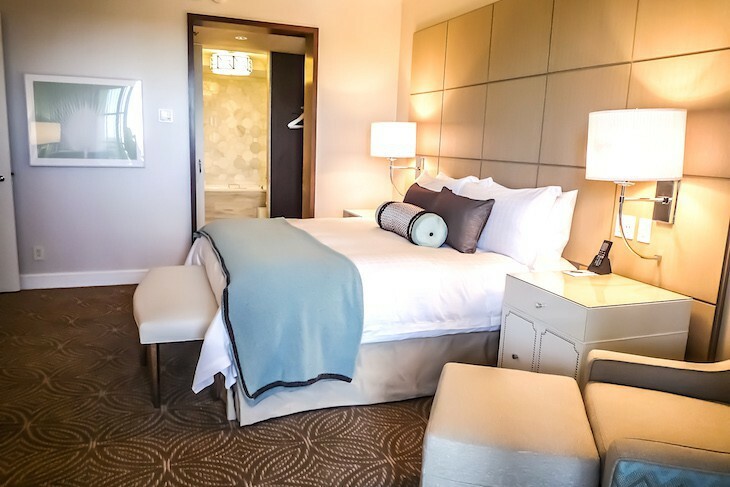 You’ll love the high-tech IPad LaunchPort used for a variety of services: in-room dining, ice request, housekeeping, valet parking, airline check-in with boarding passes delivered to your room, concierge requests, wakeup calls, luggage assistance, stock your minibar, or send a postcard. There's even complimentary access to over 2,000 digital newspapers and magazines. Impressive! Also impressive are the sizeable, deep balconies (3rd-floor balconies being the deepest) with comfortable seating and limestone balustrades. Enter the bathroom from an open oversized closet where you’ll find more drawer space, a clothes hamper, iron and ironing. 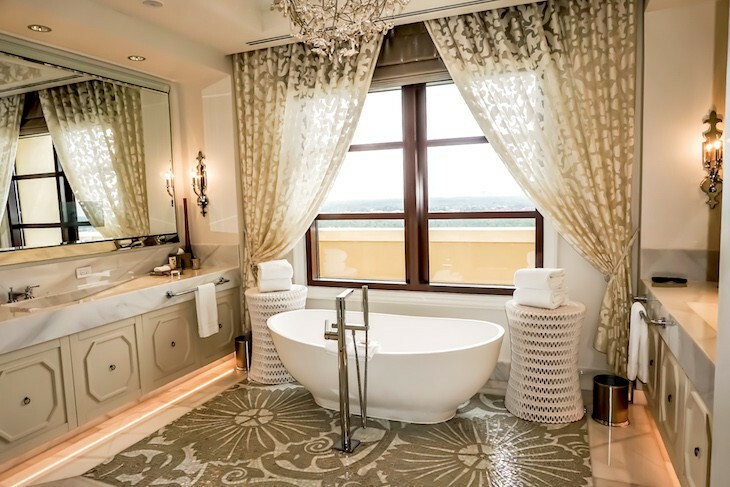 Luxe baths have honed marble floors and walls, a large soaking tub, frosted-glass shower with dual heads, double sinks, scale, C.O. Bigelow toiletries, thick terrycloth robes and plush towels, lighted makeup mirror, and in-mirror TV. And what is almost unprecedented in the Orlando market is superior lighting! Separated by a frosted glass door is a WC area. 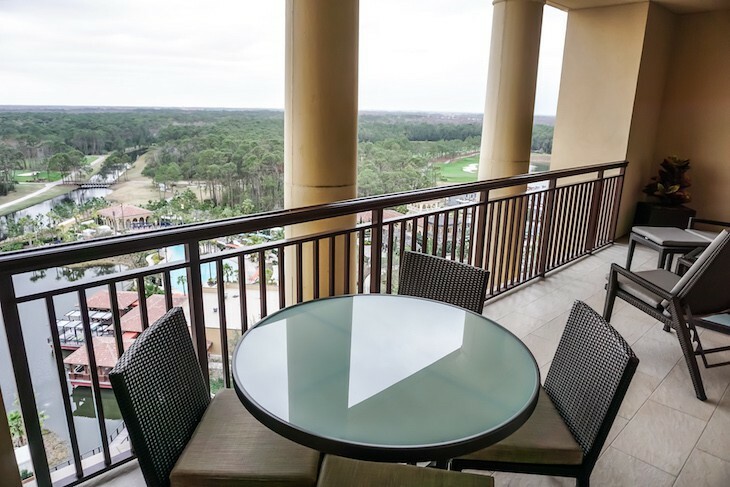 Room choices are: Four Seasons Rooms, the lead-in category, which are great price but offering an obstructed view from their perch on the lowest floors in the front of the resort; Golden Oak View Rooms, also on the front of the resort, with views of the parking lot, and the Golden Oak residential area; Lake View Rooms on the 2nd to the 5th floors on the backside of the resort overlooking the golf course, lake, and pool; or Park View Rooms, also on the back side of the resort, with sweeping views of the resort and outward to the Disney parks and the Magic Kingdom fireworks. While many of the standard rooms connect, many also offer an outdoor interconnecting hallway, very European in style. 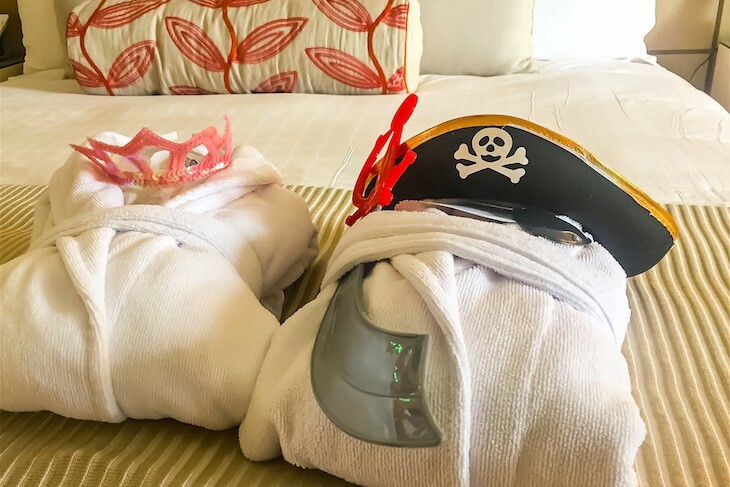 Also on request are children’s amenities such as a Diaper Genie, monitors, bottles, child-size bath robes, swim diapers, items to childproof guest rooms, highchairs, playpens, bottles, and toys. Golden Oak View and Park View Suites with 825 square feet vary mostly only in view and a slightly different room configuration. In the living room are a queen-size sleeper sofa, easy chair, coffee table, desk, and TV. 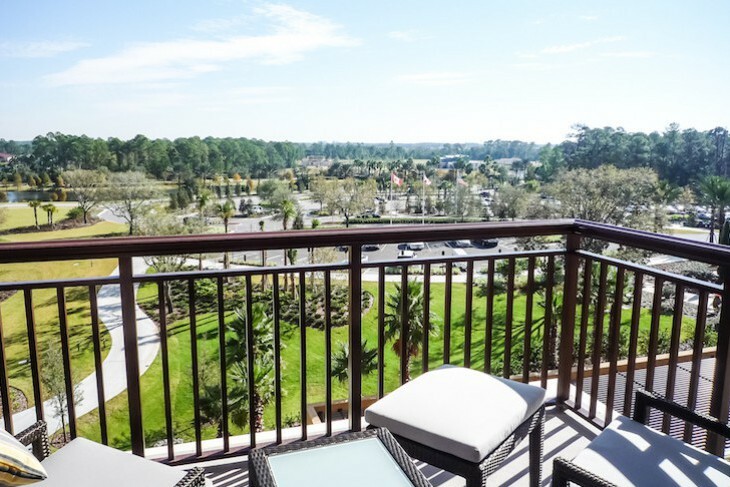 Two balconies are to be found in the Golden Oak View Suites (one off the living area with a table for four, and the other off the bedroom), but one large balcony in the Park View Suites that can be accessed from either the bedroom or living room. An additional full bath sits off the entry hall with shower and single sink. In the bedroom is a king bed, two bedside tables, bureau, TV, and large walk-in closet (two easy chairs and an ottoman are also to be had in the Park View Suite bedroom). The bath is the same as a standard size guest room. These can become two-bedroom suites connecting to a standard guest room with either a king or two double beds. Park View Deluxe Suites (6th to 15th floor) and Lake View Deluxe Suites (4th and 5th floor) come with 1,000 square feet; the additional space is found in the entry hall and the living area with room for a larger dining table for four. In the living area are a queen sleeper sofa, two easy chairs, an oversized square leather coffee table, desk, and large credenza with huge TV. 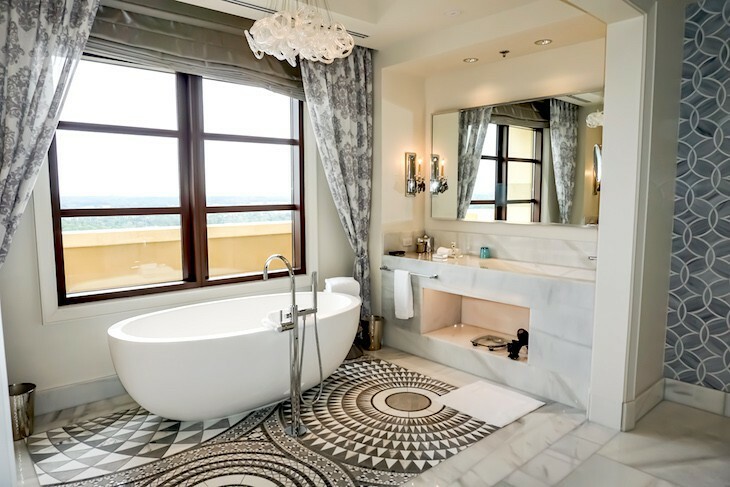 An additional full bath sits off the entry hall with sparkling ocean blue tile, white marble pedestal sink, and shower. In the bedroom is a king bed with sea blue leather wall headboard reaching to the ceiling, pistachio green accents, two easy chairs, bureau with an additional TV, and two-sided walk-in closets. The stunning bath (honestly, you would never see a bath even remotely like this one except in a Presidential-category suites at the Disney resorts), accessed through an arched doorway with a mirrored sliding door, comes with an oversized, very dramatic contemporary tub that literally hangs off a mosaic wall, double sinks. There is also a large shower and separate commode area. A balcony extends the length of the suite. This can become a two-bedroom suite connecting to a standard room with either a king or two double beds. 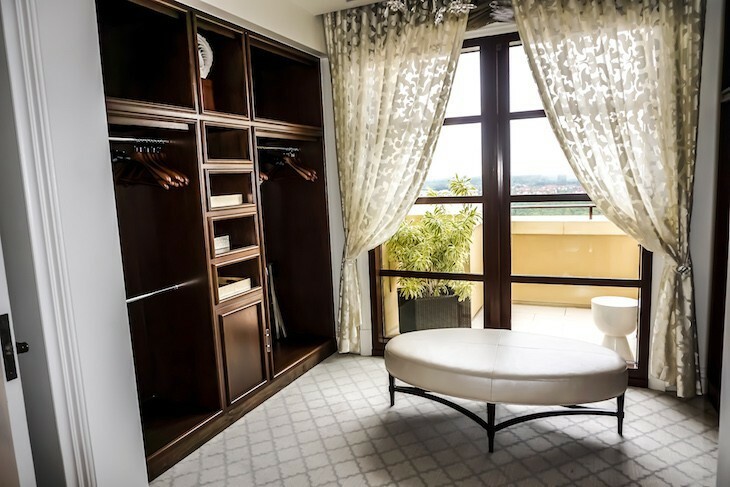 One-bedroom Grand Suites are found on the 14th, 15th, and 16th floors with twice the living area of the Park View Deluxe Suites. 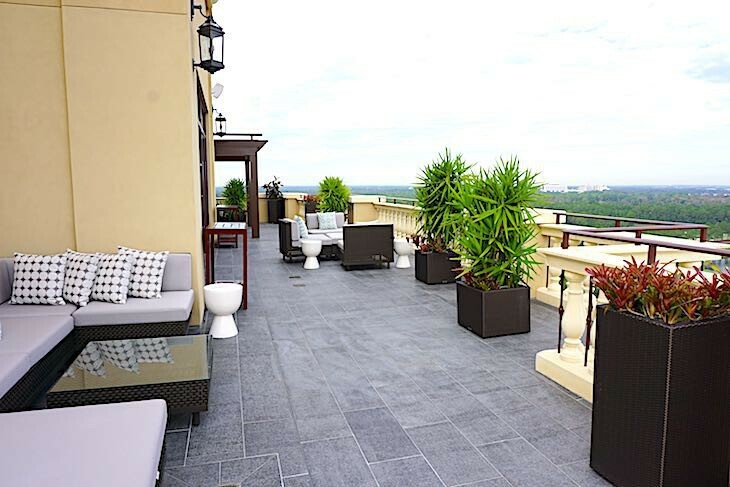 Grand Suites, found on the 14th, 15th, and 16th floors with twice the living area of the Park View Deluxe Suites. 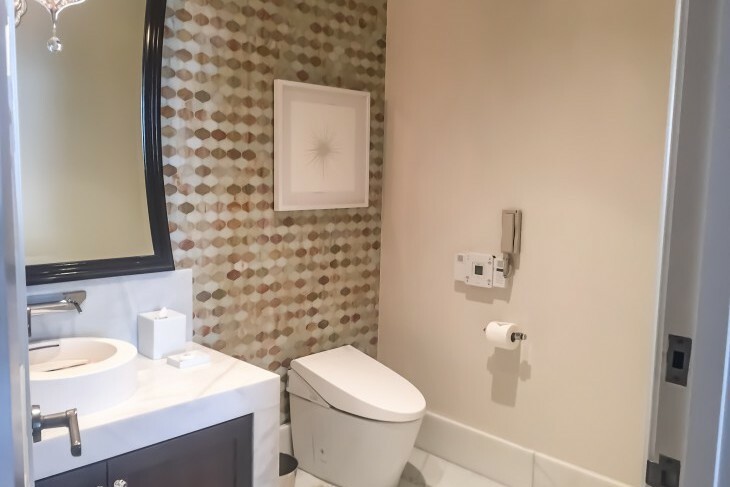 The entry hall offers a grand welcome with marble mosaic tile flooring and a very contemporary half bath with a cylindrical sink and stunning marble patterned wall. I love the striking wood patterned ceiling in the spacious living area as well as its modern black and white carpeting, oversized dove gray sectional sofa with kiwi green accents, and two white leather Mid-Century modern, Barcelona-style chairs, all seating up to 10 people. An oversized TV sits on a credenza, and in an alcove you’ll find a desk and chair. The dining table seats eight, and the adjacent wet bar holds a small refrigerator and counter seating for two. 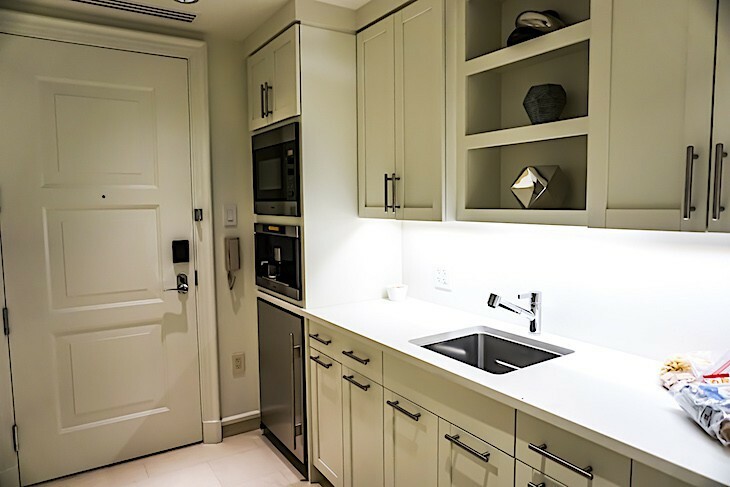 Just off the wet bar is a great service pantry with Sub-Zero undercounter refrigerator, Miele coffee machine, microwave, another sink, and a nice assortment of cups, plates, wine glasses, flatware, etc. 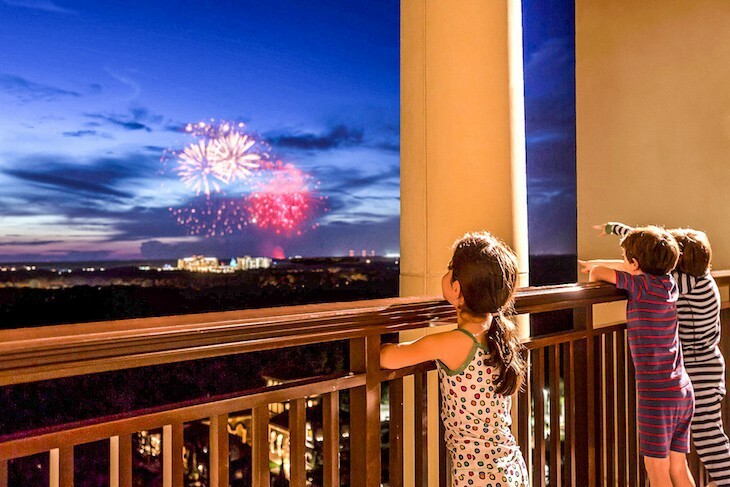 The suite boasts two deep balconies, one running the length of the living room, where we spent many a relaxing hour enjoying the views of the resort’s pool, golf course, and the Magic Kingdom’s nightly fireworks display. Extra luxury touches include a Bose sound system, motorized touch drapery, and a touch lighting system. And, as in all guest rooms, is a IPad LaunchPort used for a variety of services: in-room dining, ice request, housekeeping, valet parking, concierge requests, wakeup calls, luggage assistance, stock your minibar, and more. We enjoyed ordering room service from the easy-to-use menu, even ordering up our breakfast the night before and setting the exact time we wanted it delivered. The master bedroom’s cushy king bed, is adorned with an accent wall in a black and white floral pattern, and at its foot is a black leather bench. You’ll also find a desk, white easy chair, and another balcony. 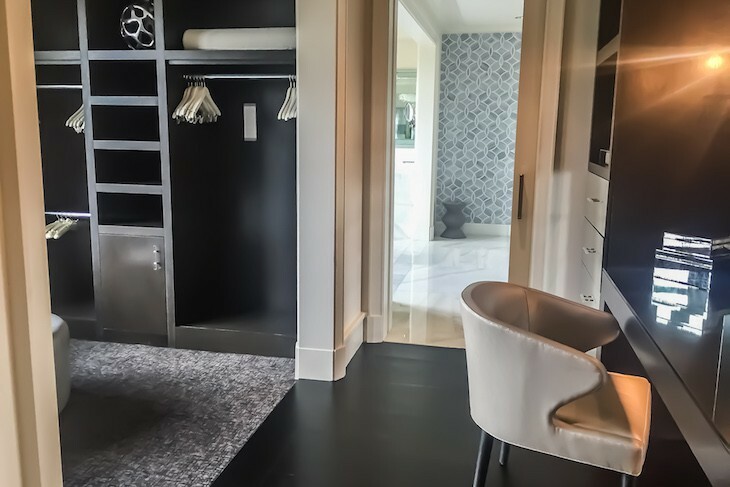 The bedroom’s two-sided walk-in closet is a luxury, one side for hanging and the other with loads of drawer space. 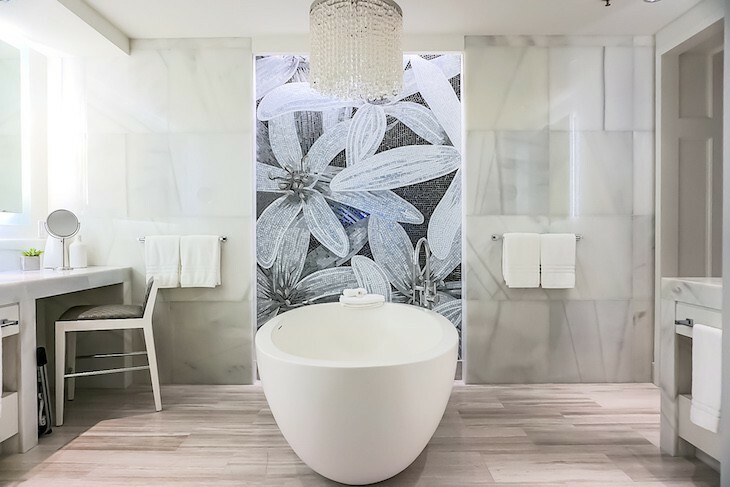 The first thing you can’t help but notice as you enter the spacious master bath is the gorgeous freestanding tub behind which is a sparkling tile mural in black and white floral. 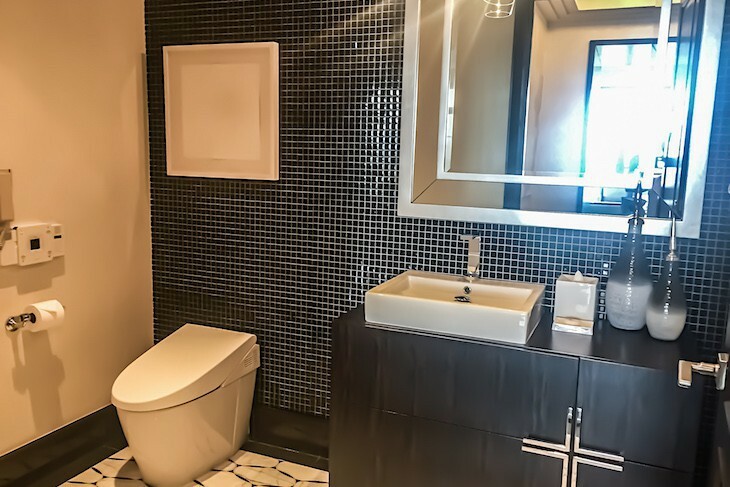 Also expect dual Carrera marble vanities—one with a very convenient high vanity stool and makeup mirror, and both with an in-mirror television—oversized shower with multiple high-power shower heads (hand-held, rainfall, and two body spray panels), and a separate room with a bidet and toilet. 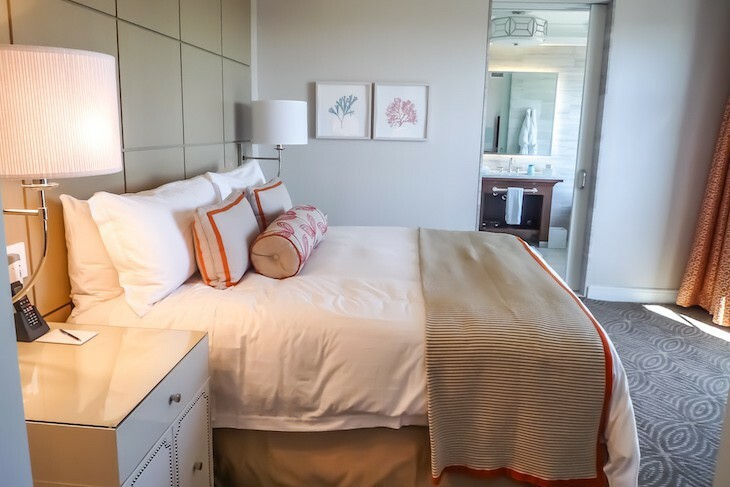 While the Grand Suite boasts 1700 square feet, up to four additional connecting bedrooms can make this a 5-bedroom suite. 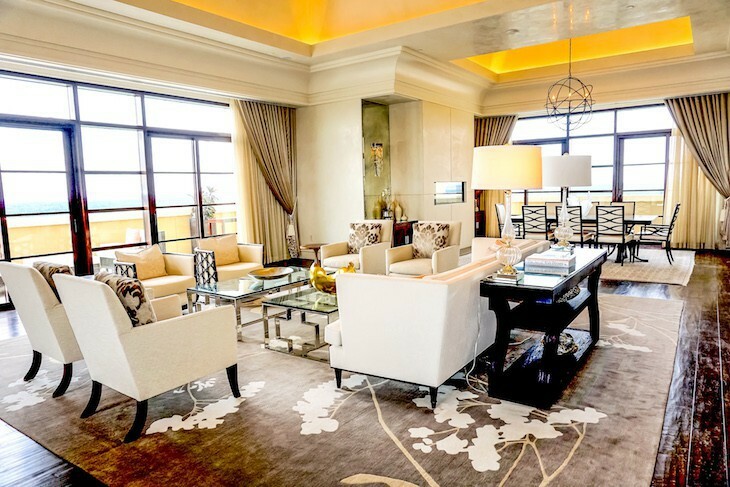 Now, for the ultimate in luxury consider a suite on the hotel’s covetable 16th floor, serious splurge territory. Here you can actually receive a top floor buy out, the ultimate resort experience for extended families and friends. 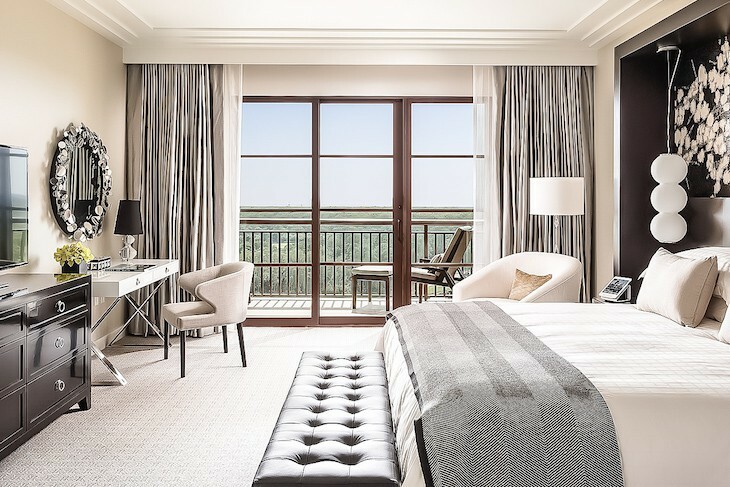 This would include the nine-bedroom Royal Suite with three living rooms, the four-bedroom Presidential Suite and eight separate guest rooms beyond these suites. 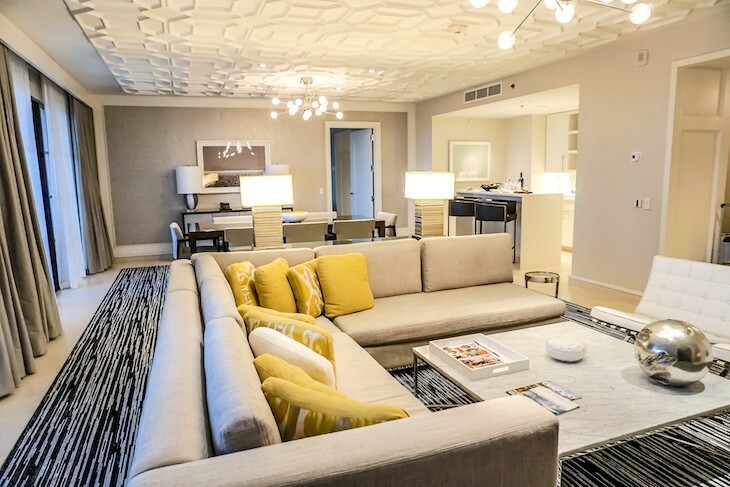 The one-bedroom Presidential Suite with 2,750 square feet connects to four bedrooms including one Grand Suite. 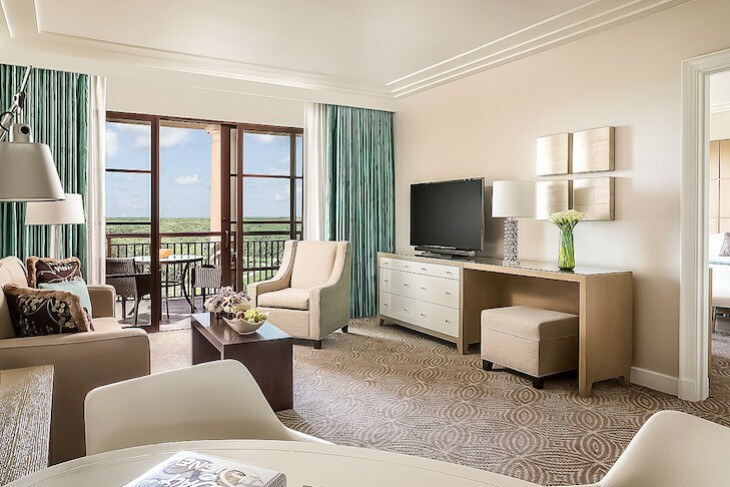 Cream chenille and beige contemporary furnishings and walnut hardwood flooring abounds throughout the suite’s massive great room. Under vaulted ceilings are two living areas, a dining area, and two wall-mounted gas fireplaces. In one living area is a sectional sofa and easy chair centered round a leather coffee table. Centered in the room is an Asian-style area rug topped with six occasional chairs and a sofa with peach accents and double glass coffee tables. The dining area holds a dark wood table seating eight in cream-colored leather chairs and the adjoining bar has two Sub-Zero wine coolers. A Bose sound system and motorized drapery add to the luxury. An office is just off the dining room as well as a service kitchen with a small oven, undercounter refrigerators, sink, and Miele coffee machine. 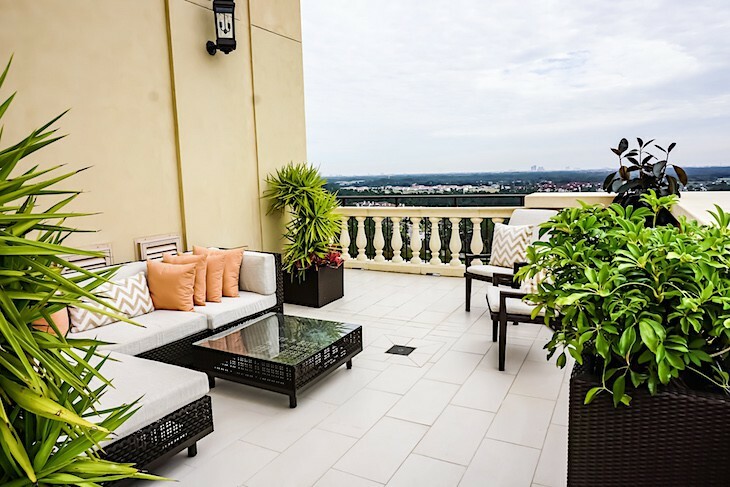 Surrounding the entire great room is an 800 square-foot terrace with plenty of seating, a dining table, and potted palms. 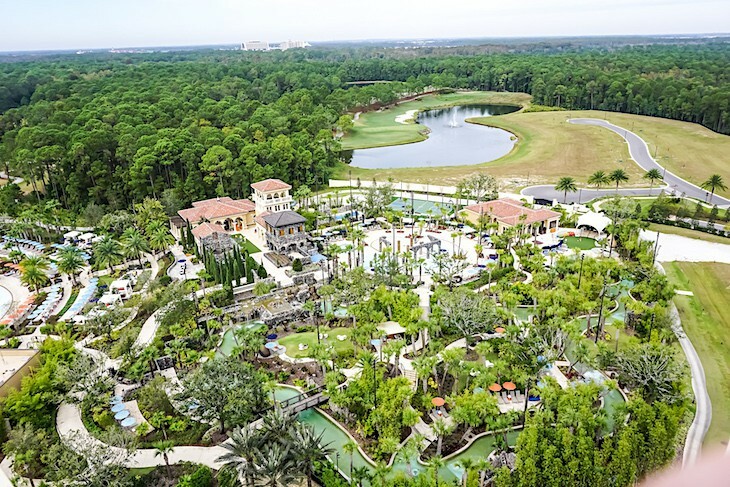 Views are of Spaceship Earth, the golf course, the pools, and miles of the surrounding area. 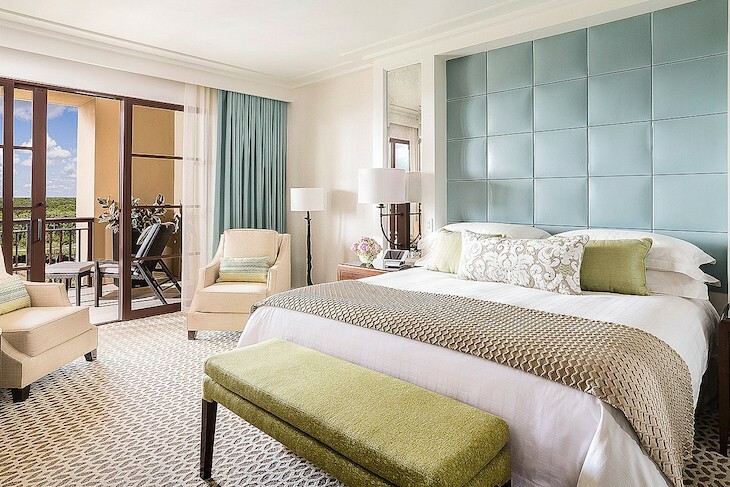 The Presidential’s master bedroom has a silver accent wall with crystal sconces, king bed facing outward to the view, two soft gray chenille easy chairs with ottoman, and shimmery drapery studded with crystals. And best of all is the media screen and projector, concealed in the ceiling, dropping down electronically for viewing. 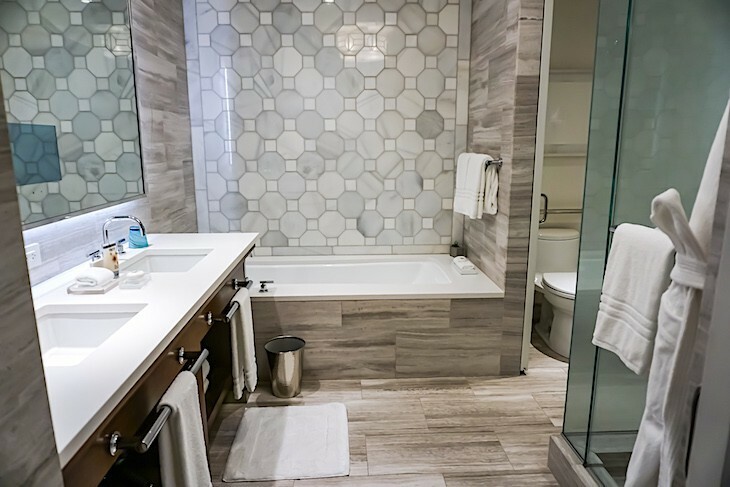 The master bath sparkles with a tile and glass mosaic flooring, freestanding tub in front of a picture window overlooking the bedroom’s private balcony, two vanities, each with a slanted sink basin built into white marble, in-mirror TVs, massive dual head marble shower, and separate toilet area. Separating the bath and the bedroom is a marvelous closet room with leather seating, tons of drawer and hanging space, and a large mirrored vanity. 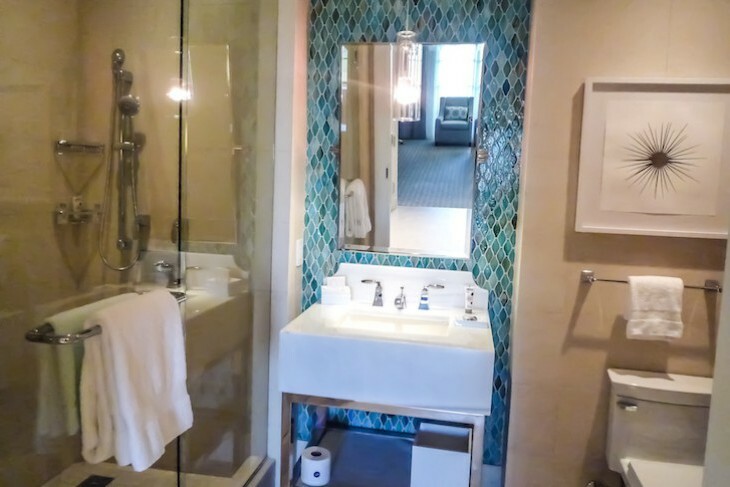 While the Presidential Suite is number 1601, it connects off the entry hall to room numbers 1608 and 1610 to form a 3-bedroom suite with a single entry; both guestrooms are a standard size, one with an accessible bath. There is also a half bath off the main entry hall with Toto Washlet. 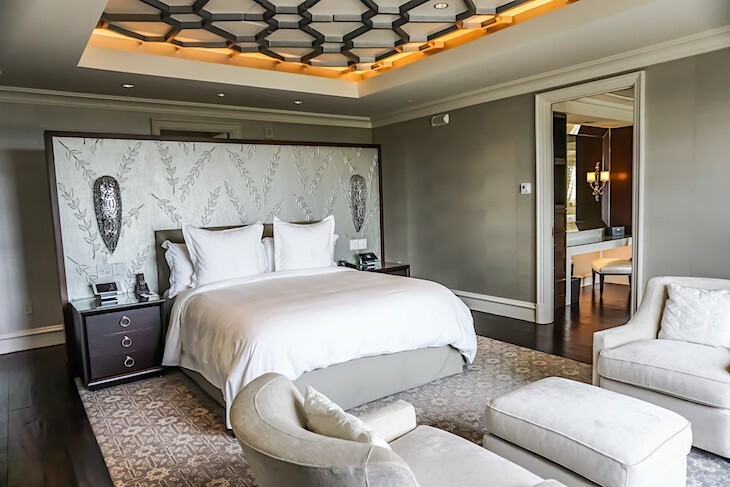 The Royal Suite offers a more masculine feel with a rich taupe and truffle palette complete with plenty of shimmering accents in its 3,300 square feet. 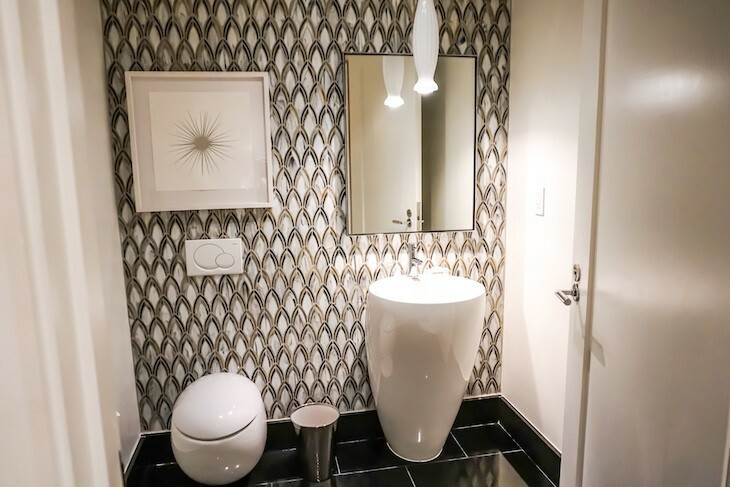 The suite’s entry, off which you’ll find a half bath, features an espresso granite and French blue limestone patterned floor with white Venetian plastered walls. Two captivating crystal chandeliers survey the great room below, flanked by two gas fireplaces surrounded in granite and black mosaic glass. Very reminiscent in size and amenities as the Presidential, here are two living areas and a dining area seating ten. Sectional rugs in taupe and cream tones warm up the espresso marble flooring, and the ice blue silk drapery adds a shining touch. There is also a separate office with sofa and desk. 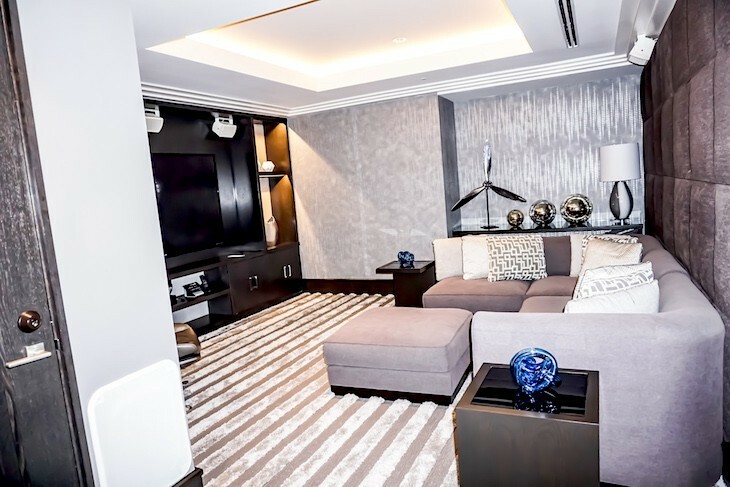 The big bonus is a media room with giant-size screen, sound-absorbing metal panels, oversized sectional sofa, silk and wool hand-knotted carpeting, and easy chair. 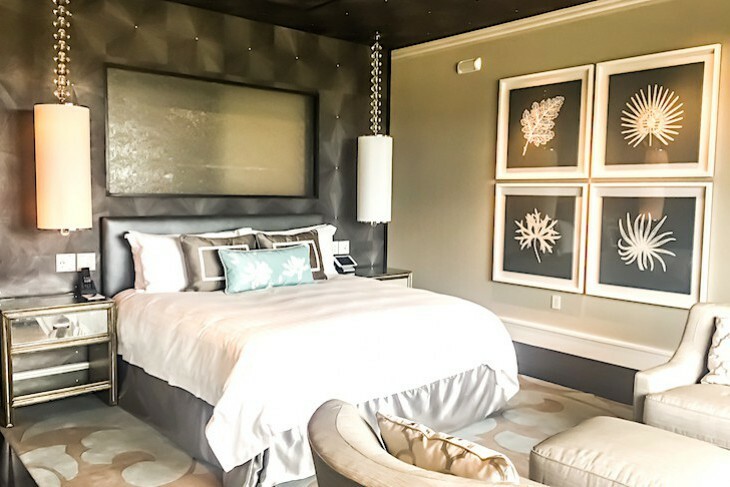 The master bedroom and bath offers the same layout as the Presidential but with silver and black tones with an accent wall of ebony and starburst-patterned crystal. 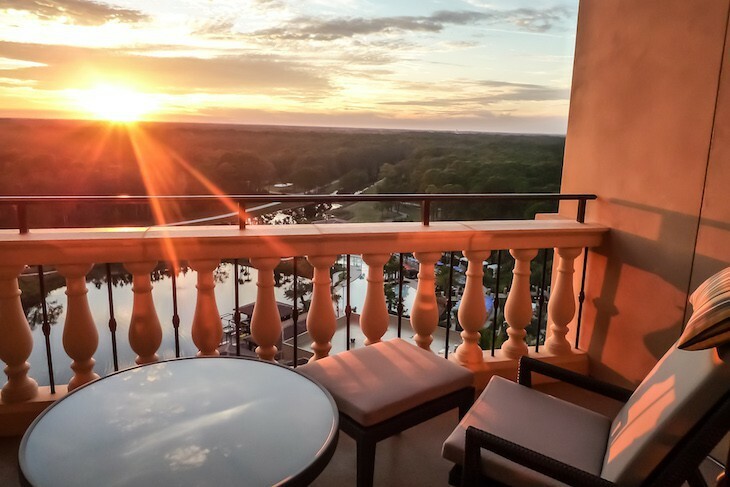 The suite’s terrace at 1,000 square feet lends itself to the perfect impromptu cocktail party, offering an intoxicating view of the Magic Kingdom fireworks, golf course, and resort pools from the 8-person outdoor dining table and a slew of sofas and chairs. 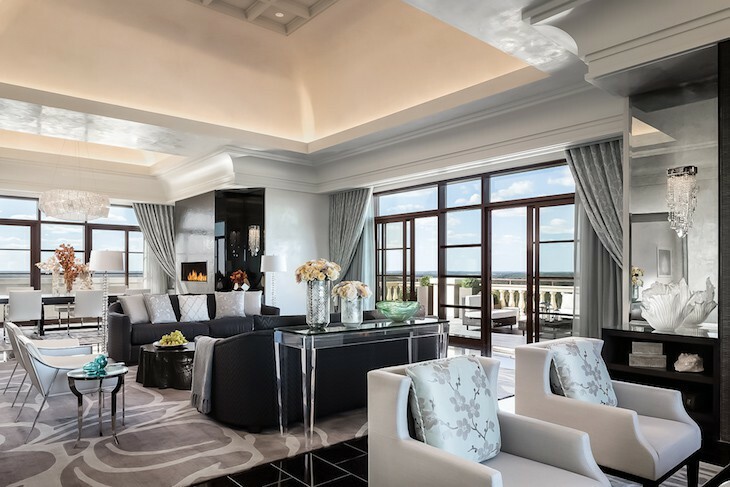 The Royal Suite connects to enough bedrooms, two of which are Grand Suites, to create a 9-bedroom penthouse residence if so desired. 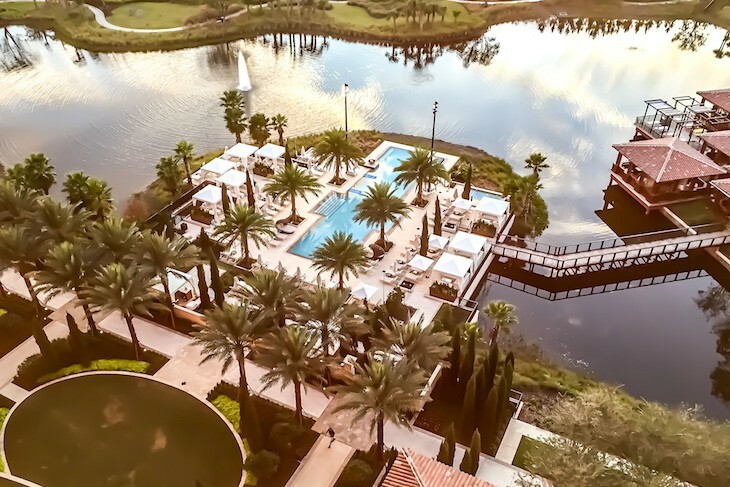 Allow me to connect you to the expert travel advisors at Glass Slipper Concierge to plan your Four Seasons Orlando vacation. Your luxury Travel Advisor and Disney Destinations expert will work with you to create the perfectly planned trip of a lifetime, making sure that nothing is left to chance.